Hilton Durban is an iconic landmark hotel offering superior accommodations in a supreme location near the Durban International Convention Center. All rooms offer panoramic views of the city or the Natal coastline, with easy access to Durban's beaches and central business district, perfect for meetings or events. Enjoy a different culinary experience at every meal when you stay at Hilton Durban. Savor a hearty breakfast at Vasco's Restaurant and innovative dishes from the chef's table at Big Easy Winebar & Grill Durban by Ernie Els. Relax with a coffee and light meal at the Coral Lounge. Daily 24-hour room service is available. Our hotel offers a dynamic business center if you are here on business, a fully equipped state-of-the-art fitness center to keep up with your routine and a grand ballroom for special occasions. Check out attractions near the hotel or simply spend quality time with the family on Durban's Golden Mile. Hilton Durban has been awarded for the fifth consecutive year at the World Travel Awards, South Africa's Leading Business Hotel as well as the Luxury Seaview Hotel of the Year at the Travel & Hospitality Awards. 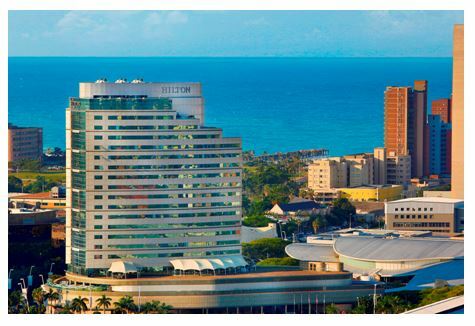 The Hilton Durban hotel is a 45-minute drive from King Shaka International Airport. For assistance with limousine, taxi and rental car arrangements, please contact the hotel. From the airport, follow the exit leading you to N2 South. Continue on the N2 South until you reach the Durban/Pietermaritzburg off ramp and proceed onto the N3 towards Durban. Exit via Johannes Nkosi Street and continue straight. At the 5th set of traffic lights, make a right turn into Walnut Road. Cross over the next intersection, Walnut & Braam Fischer. The hotel is located on your left, next to the International Convention Center. Hilton Durban WINS at World Travel Awards - 6 consecutive years!